VIRGINIA -- Two large mixed breed dogs now face the death penalty after they went on a rampage through a Denbigh neighborhood Sunday, jumping fences from back yard to back yard in search of other dogs to fight, say animal control officials. Four pet dogs were killed outright, and at least nine more were severely mauled, say officials and pet owners, some of whom went through Beechmont with loaded weapons until the dogs were captured by SPCA controllers Sunday morning. The dogs - initially identified as wolf-German shepherd hybrids and now thought to be shepherds mixed with either husky or malalmute - are in quarantine at the Peninsula Society for the Prevention of Cruelty to Animals, said SPCA director Gene Falls. The dogs' owner, Clarence E. Hacker who lives at 323 De Laura Drive, may face a charge of allowing vicious dogs to run loose, a misdemeanor that carries up to a $1,000 fine and destruction of the dogs, if a judge orders it, Falls said. Pets were attacked in back yards in a one-mile area around Epes Elementary School, Falls said. Faye Hipps was making breakfast in her house on Catalina Drive at about 8:20 a.m. when she saw an odd movement in her garden. She said she went outside in time to see "two dogs mauling my dog," a 2-year-old, 30-pound spaniel mix named Shadow. She apparently scared the bigger dogs, who jumped Hipps' four-foot fence into a neighbor's yard. As her husband and two of her three children jumped in their truck to try to follow the dogs, Hipps went to help Shadow, who was bleeding from severe lacerations to both shoulders. The dogs apparently made their way back toward the elementary school and jumped Boyd and Eunice Williams' backyard fence on Alta Crescent just before 9 a.m.
Eunice Williams had just fed the family cat out on the sun porch and was preparing food for their two dogs, Winnie, a 3-year-old, 30-pound Welsh terrier mix, and Pookie, a 13-year-old, 9 1/2-pound gray poodle mix. Williams said she was about to take a dog dish out to Pookie, who was barking at the porch door to be let in. Eunice Williams said she turned away for a minute; when she turned back, "all of the sudden she wasn't there." She went into the back yard and saw two large dogs, who jumped the fence as soon as she came outside. "I didn't see my little Pookie. I looked around. She was lying in the grass, dead." Winnie was also bitten in the neck, but apparently escaped the two dogs by running into the garage through a small dog door. Boyd Williams went after the two dogs and found a neighbor across the street beating the dogs with a wooden 2-by-4 as they tried to attack his Labrador retriever. The dogs ran away, and both men began searching the neighborhood. As they searched, they ran into others who also were looking for the dogs, some armed with loaded shotguns, Williams said. By then, five SPCA dog wardens and at least five police patrol cars were also out searching for the dogs. A couple of blocks from the Williams' home, the dogs jumped Paul Evans' backyard fence on Colleen Drive. Evans, his wife and two small children were at church. But Penny, a 33-pound mutt adopted from the SPCA, was home. By the time the Evanses found her, she had bite wounds on her neck, sides, back and belly, Evans said. Apparently, as Penny was attacked, the Evanses' cat leaped atop the fence and began to screech, a noise that brought neighbor Patti Steinberg out of her house. She saw the two dogs leap from the Evanses' back yard, looked inside it and realized what happened. Suddenly she remembered her own dog, a 6-year-old poodle named P.J. who had gotten out of her back yard just half an hour earlier to take a not-unusual jaunt around the neighborhood. As of late Monday, P.J. was still missing. Steinberg's son, Cory, as well as neighbors, spent the better part of Monday looking for P.J. "He's a small little guy," Cory Steinberg said Monday evening. "I think he just got mauled somewhere, and I just can't find [his little body]." Falls said the dogs were chased until they ran back to their own back yard on De Laura drive. Falls said both of the dogs had been loose separately in the past and had been chased, but never caught, by his wardens. On Sunday morning, Falls said, he armed himself with a tranquilizer gun and was heading for Hacker's back yard when Hacker's wife, Patti Hacker, appeared and said she'd get the dogs. She put them on leashes and handed them over. The dogs were no trouble at that point, Falls said. On Monday night, Clarence Hacker, who said he goes by the nickname "Chuck," said he was not home when the dogs dug out from their pen in his back yard and leaped the 6-foot privacy fence to escape. Hacker, who serves in the Navy, said the dogs - an 8 1/2-year-old female and her 7 1/2-year-old male pup - had gotten out before and had fought other dogs before. "They fought off dogs that have attacked my children in the past," when he was stationed in other areas, he said. With humans, the dogs are quiet and well-behaved, he said. Hacker said he was not surprised when he came home and found out the dogs had been impounded for rampaging through Beechmont. "I was surprised that they got out of the pen," he said. Hacker said a third dog, a 2-year-old male, has never gotten out or attacked another dog. It is still in the backyard pen, he said. 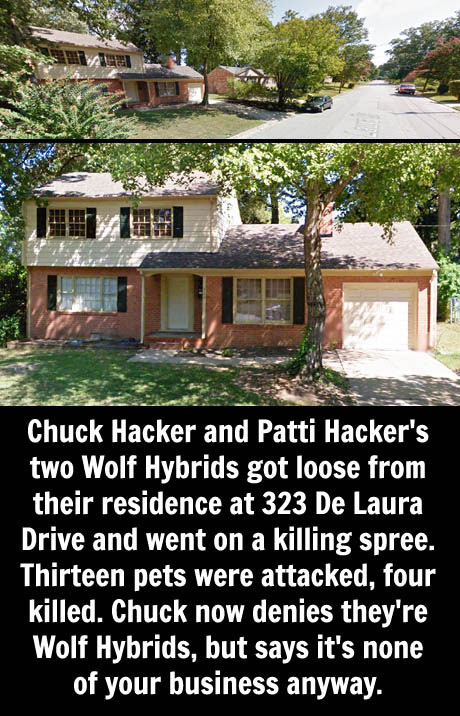 PATTI HACKER TOLD THEM THEY WERE WOLF HYBRIDS. NOW HER HUSBAND IS CLAIMING HIS OWN WIFE WAS WRONG... BUT SAYS IT'S NONE OF YOUR BUSINESS IF THEY ARE. WHAT A GUY! The SPCA's Falls said that in dealing with the Hackers' dogs when they were loose before and in talking to Patti Hacker Sunday, the dogs were identified as wolf-shepherd hybrids. On Monday, Hacker claimed the dogs were part shepherd, part husky. "Now that there's all this trouble, they say they're not wolf hybrids," Falls said, adding that wolf hybrids in general and these dogs in particular were not necessarily bad dogs. But hybrids must be trained properly and must be confined, he said. Asked if they were part wolf, Hacker said, "If they are, it's nobody's concern but mine." Guess that pretty much confirms that they are wolf hybrids. The dogs, which are licensed and have all their shots, must be quarantined at least 10 days because neighbors said at least one woman may have been bitten while trying to fight the dogs off her pet, Falls said. That woman has not come forward, however, he said. Hacker's neighbors said they are considering civil action. Both Evans and Hipps said the veterinary bills to stitch up their dogs were close to $250 apiece, and the dogs would require further medical attention. Evans noted that his children, ages 7 and 4 1/2, are about the same size as some of the dogs who were severely mauled or killed. Evans said his children are not allowed to play alone in their own front yard. The fenced back yard is different, he said. "We've tried to teach them this is their yard and they're safe in their yard. "If we hadn't been at church, most likely my children would have been in the back yard playing with the dog - what would have happened then?" Evans said. The two animals impounded Sunday for attacking several dogs in the Beechmont neighborhood of Denbigh have been identified alternately as wolf-German shepherd hybrids, shepherd-Alaskan malamute crossbreeds, and shepherd-Siberian husky crossbreeds. Both the malamute and husky are close to the wolf in appearance, and all three breeds of dog can be naturally aggressive, according to dog experts and reference information. Predicting what characteristics will become predominant in breeding two different kinds of canines is difficult, breeders say. A German shepherd is a herding dog, for instance, while the Alaskan malamute is a working dog, often used to pull heavy sleds through snow. The likelihood of a dog being aggressive increases if both parents are aggressive. How a dog is raised and trained also becomes a factor in behavior, dog experts say. Dogs bred with wolves, often referred to as hybrids, tend to be dominant, independent and even aloof, according to the "Dog Owner's Guide," an Internet reference page. Such hybrids can also be difficult to train and aggressive to other dogs, cats and small mammals, the guide says. Sources: Dr. Paul Gustafson, member of the Greater Peninsula Veterinary Medical Association; Dory Hofmann, professional dog breeder, trainer and handler at Canine Training Unlimited in Chesapeake; "Dog Owner's Guide," Canis Major Publications (http://www.canismajor.com/dog).